The non-stop barrage of controversy, tragedy, terrorism, hate, corruption, bigotry and oppression notwithstanding, things have been busy here at Photosanity. You may have seen my previous posts about the 5 myths of women’s leadership and how to bust through them. I wrote them, and they currently exist as a series of emails, but when I finished writing them, I realized that what I have is the first draft of a book. So yes - I accidentally wrote a book! I haven’t made any definite plans for publication yet, but for now, if you haven’t already done so, you can sign up for the series here. By around 3 months, life starts to get a little easier. You're starting to get into the swing of things, and your baby is starting to reward you with smiles and a little more interaction. However, one frustration I hear a lot from moms of babies at this age is "I feel like I keep taking the same photo of my baby over and over again." I know, it's hard at this age because while they're doing more, they're still not really doing a whole lot yet—pretty much all they can do is lie there, looking adorable, of course, but there aren't a whole variety of poses that they can hold. In today's video, find out what the most important photos you should be taking are... and see my homage to the NYC subway system that has taken such a big hit this week. Yes I know, what a week it's been. Thank you for all the messages and thoughts - we've been fortunate to be in an area that suffered very little damage or loss of power. For all of you who have been affected, I wish you as smooth and speedy a recovery as possible. If you're interested in joining hundreds of parents just like you in an easy and fun journey towards photosanity, sign up to get FREE updates and access to my FREE video lesson and pdf guide with my Top 5 tips on taking better photos of your kids. Today for the first time ever, I thought I would do something fun which is to share my ENTIRE CAMERA ROLL with you from a mini shoot I did with my kids last week at the playground. You may have seen the best photos from this shoot on the blog on Monday. Get a behind the scenes peek at how I photograph the natural moments and emotions of active kids! How many photos do you take at a time? And how many of them do you show? Last Friday my husband was home early and so we all went to pick Liam up from preschool. I took the opportunity to bring my camera out - it's hard to keep an eye on a three year old and a ten month old and also wield a camera during the after school rush at the playground when I'm on my own! I didn't have my camera out the whole time, but I did take 94 photos over the course of about 20 minutes. A really easy way you can become a better photographer without changing anything about the way you shoot or edit is to SHOW FEWER PHOTOS. Out of 94 photos, I ended up choosing the four photos in this blog post to share. Actually, I only shared two of them on facebook, each one individually. If I showed you all 94 photos that I took on Friday I guarantee you would think a LOT less of my photography! Even if I had narrowed it down to the 30 or so photos that I considered "sharable" your eyes would still have glazed over. Nowadays, if I take my kids out and photograph them, I'm really only looking to share 3-5 of the absolutely BEST photos. Yes, it means being selective, which can be hard when it's your kids and every photo of them is adorable. But give it a try and experience the power of being selective. Today's mini-assignment will start getting you to be more selective about the photos you share. Force yourself to only share one photo at a time on facebook. If you share more than one photo from the same event, leave at least a two hour gap between postings. This is not about being perfect - pick emotionally good vs. technically good photos that are strong enough to stand on their own. Try this for a week and see how it goes. Feel free to share your experience down below in the comments section or on the Photosanity facebook page. 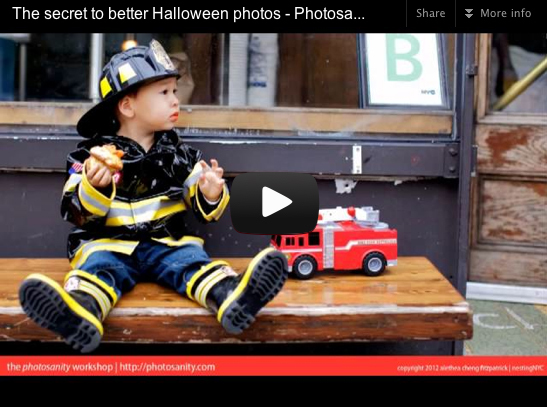 With Halloween right around the corner, I thought I'd share the secret to better Halloween photos by talking you through some of my photos from last year's Halloween when Liam was dressed as a firefighter. Want to know what strawberries have to do with achieving your photography goals?! In today's video I share with you my behind the scenes secret to getting overwhelming photography tasks completed. I'll also show you how I apply this secret to creating amazing documentation of my children's lives, day by day. In today's video I share with you my behind the scenes secret to taking the perfect sibling photo. Are you frustrated trying to capture the perfect sibling photo? If so, you're not alone, and it's a frustration I hear from many parents. Check out the video to find out my recent revelation on this issue! Are you constantly missing the moment when you try to photograph your kids? Do you have a fancy DSLR that you still shoot in AUTO mode? Are you sick of having your photos completely disorganized across several computers? Do you want to display your photos in your home but have no idea where to start? If you answered YES to any of the above, then you should check out my upcoming FREE live online workshop, Quickstart your Photosanity. I'll be giving away tips and strategies you can use right away, including some of my best material yet! I'll be taking live questions and will also be previewing the upcoming Fall 2012 session of The Photosanity Workshop for which attendees will receive a special discount. 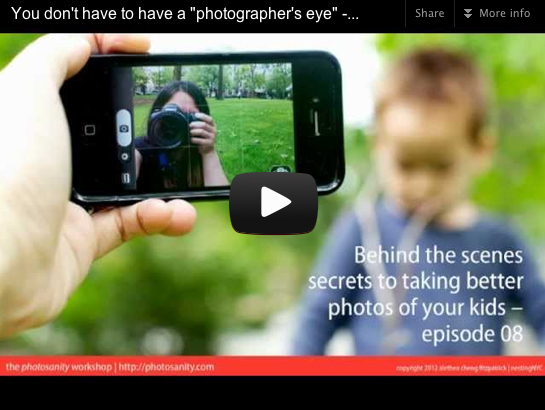 In today's video I share with you a comment one of my workshop alumni made that really caught my attention, and the truth about what you really need to take amazing photos of your kids. This is the secret to what holds many parents back - I see it and hear it all the time. nyc baby, child and family photographer, former architect & mom alethea cheng fitzpatrick is based in brooklyn. her company, nestingNYC, specializes in baby photography as interior design & interior design for babies. she also teaches an online photography workshop for parents. find out more about The Photosanity Workshop or send her an e-mail! In today's video I share with you my juiciest secret about photographing your kids! Summer is rapidly coming to a close - I can't believe it! While time is flying quickly, there are still a few weekends left to make it to the beach. But do you find yourself struggling with capturing good photos amidst the crowds? Watch today's video to see how I handle a crowded situation. Whoa, what do Christian Bale and Rescue Dawn have to do with taking better photos of your kids???? Watch today's video episode to find out! Thank you to Jessica Williams of TechBizGurl for the inspiration in her blog post, The Entrepreneur Rises, and, as always, to Katie Jane Photography for the photos of me featured in today's episode. A common frustration I hear from parents all the time is that they always feel like they're missing the moment, and when they pull out their camera, their kids fall into cheesy poses, or run away. So I want to share today's secret with you so that you know how to avoid this problem. Enjoy - and if you have any questions, please post them in the comments! This week we're looking behind the scenes of one of my all time favorite photos of Jack and Liam so far... that was not what I set out to capture at all! Find out my secret to capturing gold from a situation that is NOT going how you wanted it to. Missed last week's video where I appear on camera to talk about Photosanity? "Meet" me now!